Scholarship Scams are truly awful, because they appeal to people who generally are not financially well-off, but who are desperate to get scholarship-funding and a place at University, so that they can gain a good education and improve their future prospects. Scammers know how much gaining a scholarship at University means to people, and so they target vulnerable people and fraudulently obtain money from students and their families. Scammers are crafty and will often pose as official looking bodies, such as the government, foundations, or agencies; and they have very authentic official sounding names. So, how can you tell who to trust and who to avoid? 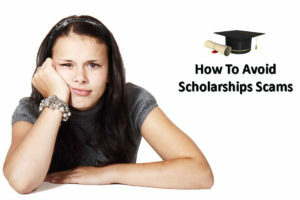 This article will help you to avoid scholarship scams. If a University is offering a loan to pay your fees (sometimes known as an ‘advance-fee loan’, this isn’t a scholarship either. Again, they’ll request you pay them a set amount of money, before they release the loan. You pay the fee, but never receive your loan. Genuine educational establishments would never ask for an upfront fee (it could be disguised under many names: application; processing; guarantee etc). If you have any doubts about whether a loan is genuine, check with your bank. If any scholarship offers ‘guaranteed success’ then it’s probably not a scholarship. Scholarships are given out by Universities sparingly, and generally to the student/s they deem to be most closely aligned to the area of study – so they’ll pick students who are outstanding with excellent grades, who show a good likelihood of achieving a high quality degree. They won’t guarantee a scholarship to every student who applies. If they claim to refund your fees if not successful, never fall into the trap of thinking you have nothing to lose, as they may take your money or send simply a list of scholarships you could ‘apply’ for that seem to match your skills. If you receive an email or letter about ‘unclaimed scholarships’ this too is nonsense. If you attend a ‘seminar’ and it feels like you’re being persuaded to ‘buy-in’ to the scholarship scheme, there’s a strong likelihood it’s a scam. Universities are inundated with scholarship applications, there should be no need for them to persuade you of the benefits of applying. If you ever receive an email saying you’ve won a Scholarship Prize, but need to send money before they’ll release your prize, this too is a scam! Likewise if you’re sent a cheque that you need to pay fees on – this too is a scam. Bottom line: scholarships are free. You don’t have to pay money to receive it. If they ask you for money, it’s time to run away and run fast.